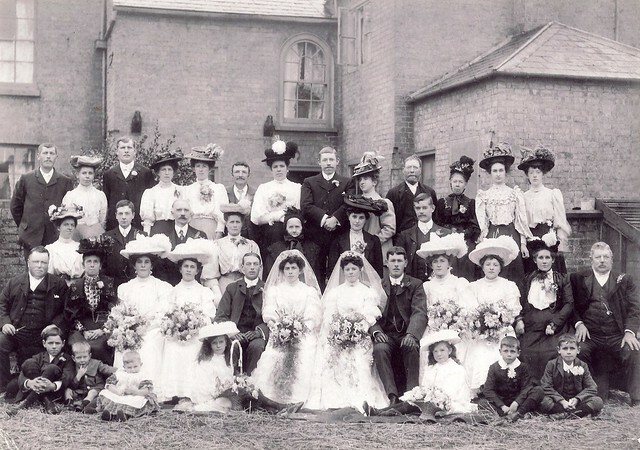 Wordless Wednesday – this week is a photograph of a double wedding taken in about 1913. A double wedding for the Barber family in about 1913. What a wonderful photo! It’s great to be able to see examples of clothing from that time period. Hi Heather, great isn’t it? I’ve never seen a photo of a double wedding either. If anyone has any better idea of the year, or even time of year, that would be very helpful. Judging by the hats and clothes of the non-bridal party attendees it could be as early as 1908, the year my grandmothers were both married (separate ceremonies & locations) in Canada. I have the one outfit with the cartwheel hat & ostrich feather and a tailored gored skirt. The blouse was high collared, full sleeves like the ones in the back row, pouched front and made of silk. When i received the photo, the relative guessed 1907, but named one of the brides as someone who had actually married in 1913 – so there’s my confusion. Interesting that you think it’s so close to their original guestimate though as that could mean that the wedding is not who they think it is. Further to my brief comments at Flickr, I believe the couple to the right are Robert Ernest Smith (1883-1962) and Florence Maud née Parker (1883-1968) who were married on 23 Oct. 1907 in Ely St Mary. Facial features suggest that at least one of the bridesmaids may be a sister of Robert, e.g. witness Amelia Elizabeth Smith (b. 1892). Another sister, Mary Ann Smith (b. 1886), married Sydney Hall, also in the Ely district and during the final quarter of 1907. Perhaps you can check whether their wedding was held at St Mary’s on the same day. I have no details of them after 1911, when 25-year-old “May” Hall was with her parents (Abraham and Annie Smith) in Ely. She had been married for three years and was not a widow but there seems to be no sign of Sydney. I’m not related to these families – just curious about how the photographer managed to arrange them all without breaking too many conventions!